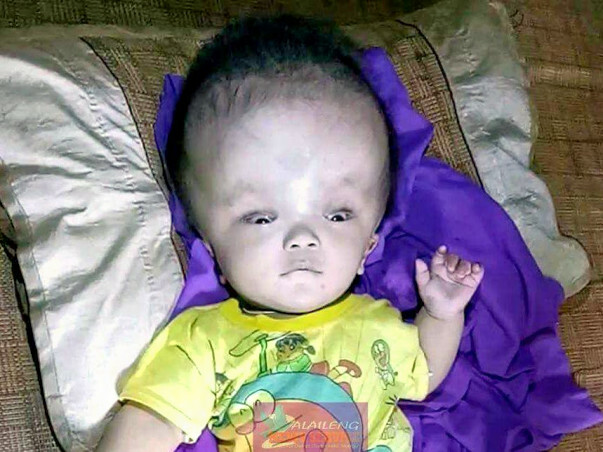 The parents of a eight month-old toddler, Mimin, born with a potentially fatal disease, hydrocephalus that causes cerebrospinal fluid to build up on the brain, are seeking help for their daughter’s treatment. 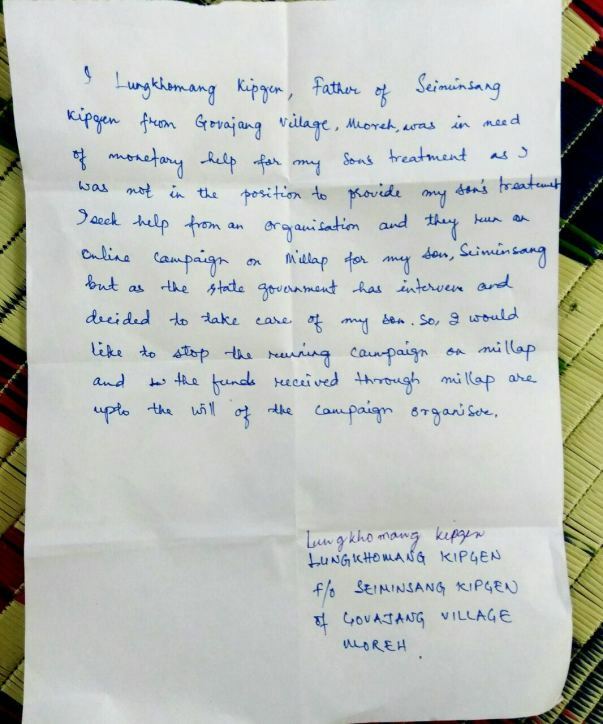 Born to a family of poor landless laborers in Tengnoupal district of Manipur in northeastern India, Seiminsang Kipgen, fondly called him Mimin, has been suffering silently for the past five months. 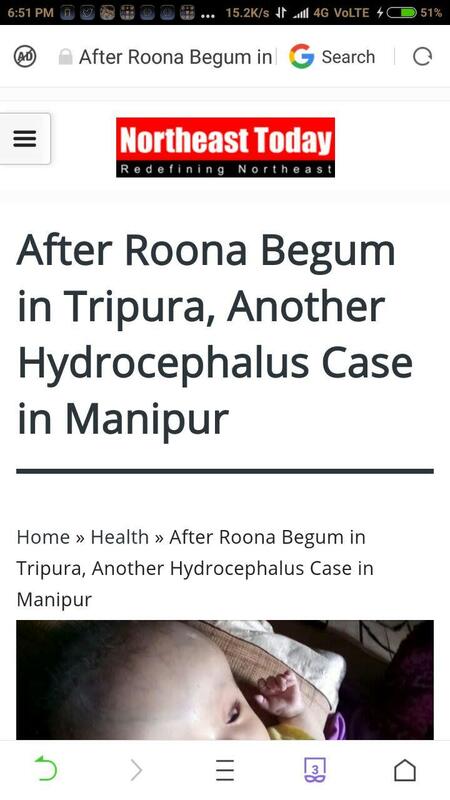 Help People in Need, a local non-profit, has started a crowdfunding campaign for the poor girl in Milaap (India’s version of Gofundme) hoping that the people from world over would pitch in to help as they did in the case of Roona Begum who underwent a life-changing surgery in 2013 with the funds raised through crowdfunding. Hydrocephalus is a rare condition where the cerebrospinal fluid accumulates in the brain, causing extreme swelling and a buildup of pressure. It is more common among infants and older adults. The condition is caused by overproduction, obstruction or lack of absorption of the cerebral fluid in the brain. 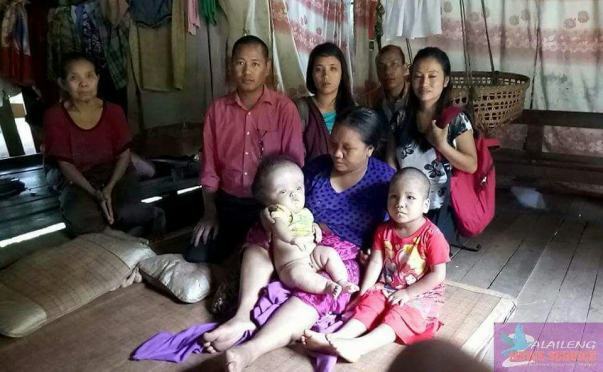 The rare condition of poor little Mimin came to light on August 4 at his native village when a three-member team of Genhison WhatsApp group, led by Robert Hekai Kipgen visited the family in the village. Kipgen donated a sum of Rs. 20,000/- to the family. Mimin is not able to keep his head straight as it is three times bigger than the size of a baby of his age. He could not crawl, sit up or roll over. The skin of his head has stretched so much that it has pulled his eyelids over his eyes and forced his eyes to recess deep into their sockets making it impossible for him to see properly. Mimin is the sixth child of Lhunkhomang Kipgen and Nengneithem Kipgen. Like his other siblings, Mimin was born normal and weighed 4kg at birth. But his mother Nengneithem was shocked to see the sudden weight gain in the baby after a month. “I was at a loss as to how the baby gained so much in a month. I took him to a nearby dispensary for immunization and came to know that he weighed 9kg,” says mother Nengneithem Kipgen. “With every passing day, his head started growing bigger. He would just lie in the bed and keep crying intermittently. 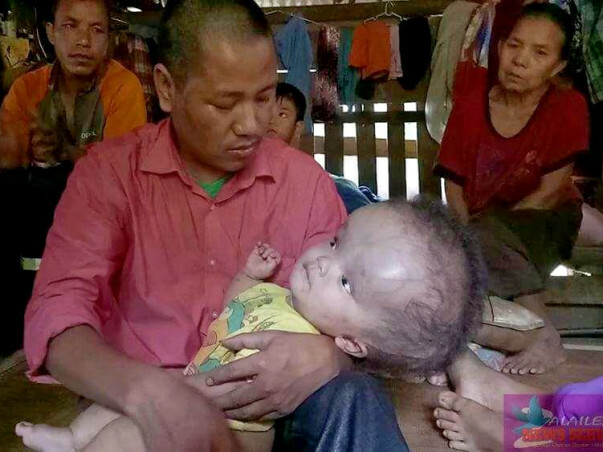 It became very difficult for us to carry him and take him anywhere," says Nengneithem. In the next two months, his weight increased at a rather slow pace. 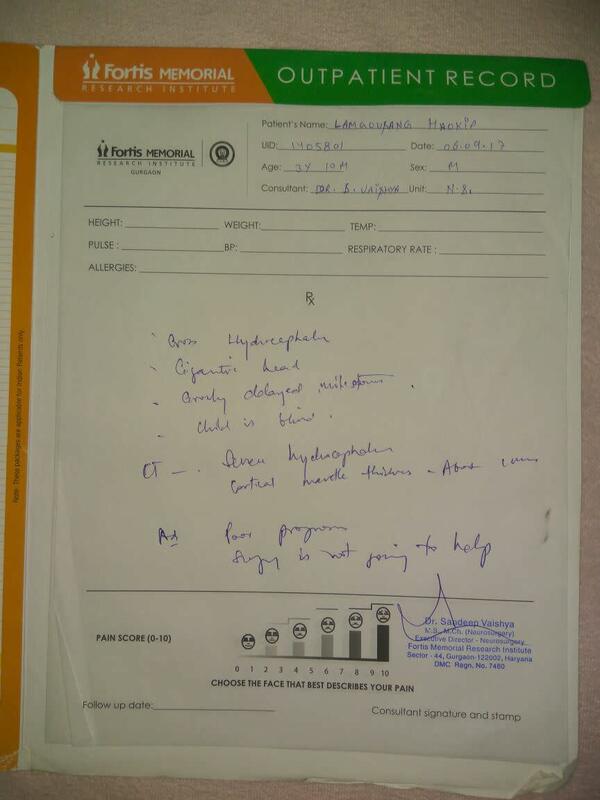 Doctors at Moreh Hospital confirmed that weighed 11 Kg in April. “I feel completely helpless. If his head keeps growing like this, it will rupture someday. Also, the tears keep rolling down his cheeks even when the baby is not crying,” Nengneithem, the home maker and mother of six who has spend most of her time tending to Mimin. The baby weighs 15kg and, of which, 10kg is the weight of his head only. 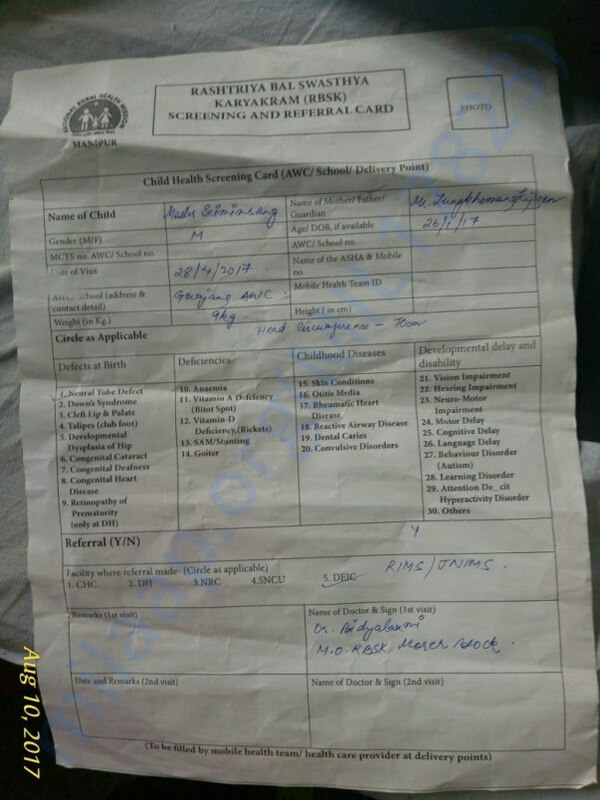 The family has taken the boy to several state-run hospitals, but they have advised the parents to take Mimin to a better-equipped hospital in a metropolitan city. 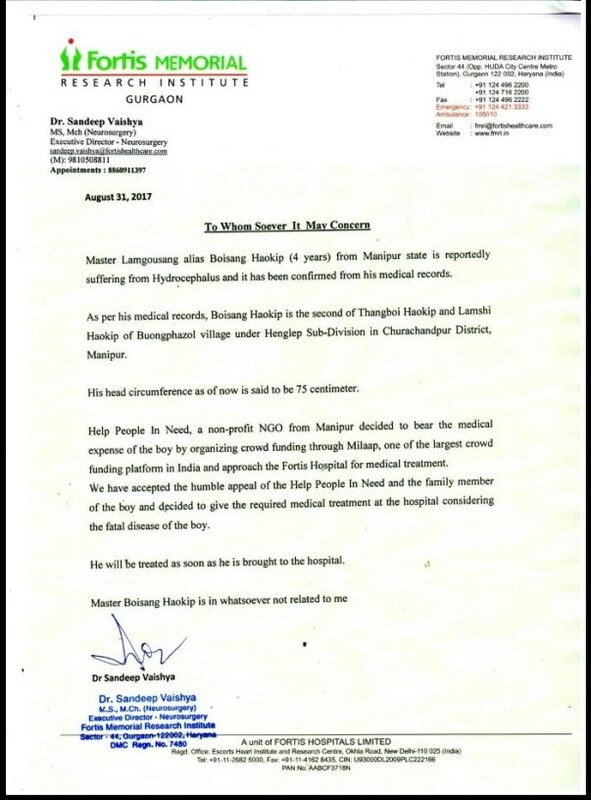 Father Lhunkhomang Kipgen, who earns less than Rs. 500 a day, somehow makes the ends meet. 'We are very poor and we were not in a position to arrange for all the funds required for the treatment. My son is in a lot of pain because his ever-swelling head. But I could still see him smiling sometimes that makes me think that his cognitive functions might still be intact”, said 43-year-old. As the condition of the boy worsens further their neighbors have cruelly name him the “alien boy”. Hence the family decided against the treatment and have traveled back to their village. The funds raised for Mimin have not been utilised for Boisang. Please note that refunds take 3-5 working days from date of refund to reflect in your bank account/card statement. 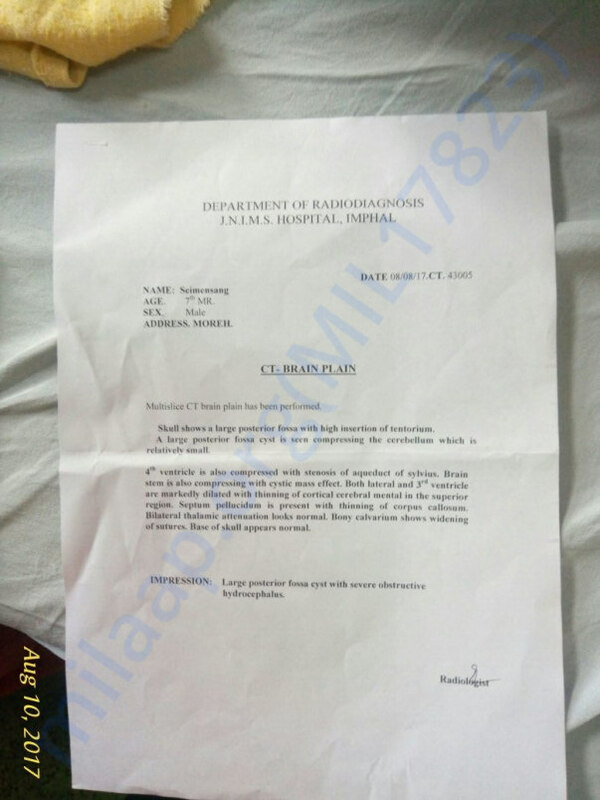 The family of Mimin called us for a meeting day before and told us that the state government of Manipur will be taking care of Mimin at RIMS hospital Imphal and expenses for the surgery and investigation will be borne by them. Thanks to few donors, Gaurav and Jassi, they were offered treatment at Delhi - however, the family politely turned it down citing travel constraints for extended period of time during treatment. The funds raised were yet to be utilized. After speaking to the Milaap team, here’s how we can proceed with the funds raised so far. You can request for a refund by replying to this email within 7 days. Milaap team will initiate the same. Also, just a heads up, it usually takes 3-5 working days for the funds to reflect in your bank account. We request you to support Boisang, but the choice is yours. please let us know by replying to this email. Again, I want to thank you for being a part of this life-changing experience. Northeast today article bout Mimin, thank you all for the support.